Selecting process management software is hard. This article scores five top business process management software tools on 27 requirements from medium-sized businesses. Business process management is a comprehensive effort to visualise, execute, improve, manage and automate your company’s recurring work across roles, on an ongoing basis and on one single platform. Consequently, we have written this article to help you find that platform that can improve your ability and agility as a business. We have written this guide for managers and executives in medium-sized businesses and organisations that want to succeed with business processes. The guide is a result of our internal competitor research efforts. So Gluu is also in the vendor comparison below. Consequently, we’re trying hard to be objective and we’ve had two independent reviews of this article to ensure that we’re fair. However, remember that the requirements and approach are what we find important in this space. They represent what we have found during seven years of talk around the business needs of hundreds of customers and prospects look for the best business process management software tools. If the criteria below don’t match your management needs then this guide will not be able to help. In writing the guide we have looked at the following variations of BPM: work processes, workflow automation, workflow process, workflow software and process modelling. Dedicated compliance, case management and process automation software are only lightly covered. With this out for the way – let’s dig in to find the best applications! Easy to implement and use for both administrators, management and end users. Secondly, make the standard way of working easy to understand. Enables ongoing communications and feedback so everyone is involved. Makes business workflows easier to execute the right way. Collects input and data to improve business processes. Integrates with other systems to automate tasks. Finally, to ensure solid management and governance around business processes. For an in-depth explanation of each requirement, you should read our guide to business process management software. We have excluded software tools that were either too heavy and sophisticated or too light and focused on task management and automation. Certainly, they may be good software tools in their own right – just not suitable for business process management in medium-sized businesses. Due to this, only Heflo, Tallyfy, Kissflow, Flokzu and Gluu met all of our criteria. Once a workflow is set up inside any of the tools, then it is enforced well. The challenge arises when the flow spans multiple departments, systems and roles, then visual flow and clear organisational roles are needed. This is where tools such as Tallyfy seem to miss the end-to-end overview. The main difference when it comes to communications is that where the other top business process management software is focused on communications around the specific case, Gluu is more focused on communications around the business process and its activities. So, if you plan to do most of the work using the tool only, then workflow-based tools are better. If you plan to use the tool to control and ensure that activities happen in other systems, then Gluu is the choice for you. When focusing is more on “doing the job” rather than “why and how to do the job” then Tallyfy and Kissflow comes out slightly ahead. Gluu differentiates itself by enabling frontline and field service staff to report back with geolocation and photos when tasks are done. Tallyfy falls short since it has no “meta-level” where you get an overview across. In contrast, Heflo, Kissflow and Flokzu offer more advanced reporting with run data. While Gluu is focused on reporting on compliance in terms of task completion and documentation. A Zapier integration offers easy integration with hundreds of cloud software apps. For this reason, Tallyfy, Kissflow and Flokzu come out on top in this area. On the other hand, for companies that have a “Microsoft focused IT strategy” then only Gluu is hosted in Microsoft’s Azure cloud. Ideally ready integrations to integration software platforms such as Zapier. Medium-sized businesses require solid governance of their business process portfolio. Therefore, they need advanced rights management, multiple editors and tools to manage hundreds of flows. 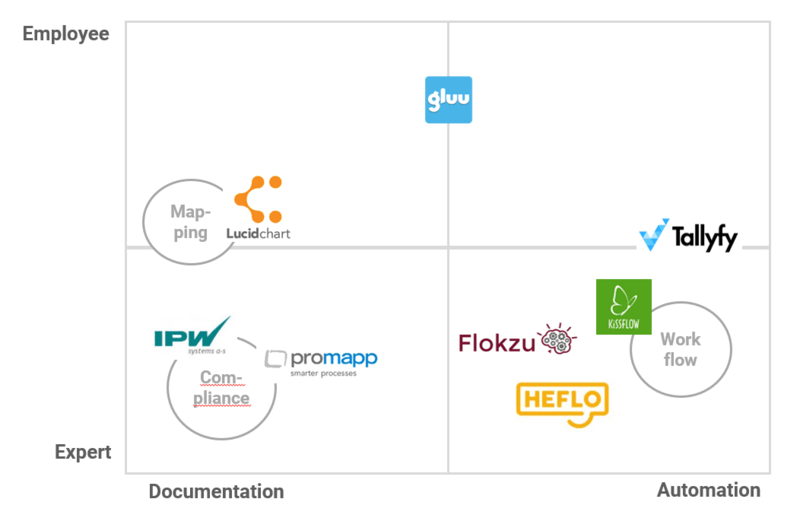 Here how Gluu’s capabilities within process portfolio management stack up against other top business process management software. So, if you’re looking to automate tasks across multiple cloud services then all of the top business process management software such as Tallyfy and Kissflow may be your best options. On the other hand, if you’re looking for a tool that spans all the moving parts of business process management – the process maps, instructions, organisational roles and communications needed – then you should try Gluu. This includes “enterprise architecture” such as the ones described in this review by Gartner. Furthermore, the selection also includes what we would call “classic” BPM tools that for a small group of well-trained and experienced experts can help deliver on all the disciplines of BPM as listed above. Example screenshot from this group of software. Some top business process management software talks about BPM when in fact they are mostly focused on automating procedures and writing work instructions.